Elizabeth Dean Lail (born March 25, 1992[better source needed]) is an American actress. 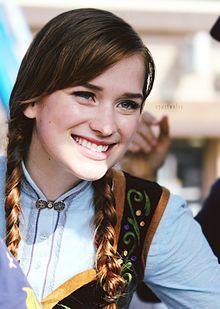 She is known for her starring roles as Amy Hughes in the 2016 Freeform television series Dead of Summer and as Guinevere Beck in the 2018 Lifetime television series You, and for her recurring role as Anna in the fourth season of the ABC adventure fantasy television series Once Upon a Time. Lail was born in Williamson County, Texas, to Dean Franklin Lail and Kay Lurene Surratt. She has one older sister. Lail grew up in Asheboro, North Carolina. After graduating from Asheboro High School in 2010, she attended the University of North Carolina School of the Arts, graduating in May 2014. Lail mostly worked in student film productions, such as Model Airplane and Without, immediately after graduating from university. She had moved to New York City to pursue stage work when she landed an audition for ABC's Once Upon a Time, after which she was cast as Anna in the fourth season of the series. Lail was cast in a starring role in the Freeform horror series Dead of Summer playing the role of camp counselor Amy. On July 27, 2017, Lail was cast as a female lead in the Lifetime television series, You, opposite Penn Badgley and Shay Mitchell. In March 2019, Lail was cast in the horror film Countdown. 2017 The Blacklist Natalie Luca Episode: "Natalie Luca"
2018 The Good Fight Emily Chapin Episode: "Day 478"
^ "WHO IS: Elizabeth Lail". Medium. ^ "Person details for Elizabeth Dean Lail". ^ "Asheboro native cast as Anna in ABC's 'Once Upon a Time'". WGHP Fox 8. July 1, 2014. Retrieved September 29, 2017. ^ UNSA (July 1, 2014). "Elizabeth Lail". WGHP UNSA. Retrieved March 7, 2019. ^ Nikara Johns (July 1, 2014). "'Once Upon a Time' Casts 'Frozen' Characters Anna and Kristoff". Variety. Retrieved November 17, 2018. ^ Michael Logan (September 18, 2014). "Once Upon a Time Gets Frozen When Anna and Elsa Visit Storybrooke". TV Guide. Retrieved February 5, 2017. ^ Elizabeth Wagmeister (February 10, 2016). "'Once Upon a Time' Alums Elizabeth Mitchell & Elizabeth Lail Cast in Freeform's 'Dead of Summer'". Variety. Retrieved February 5, 2017. ^ Nellie Andreeva; Denise Petski (July 27, 2017). "'You': Elizabeth Lail To Star In Greg Berlanti Lifetime Drama Series, Two Others Cast". Deadline Hollywood. Retrieved September 29, 2017. ^ Jordan Crucchiola (March 15, 2019). "You Star Elizabeth Lail Will Remain in Danger for the Horror Movie Countdown". Vulture. Retrieved April 16, 2019. This page was last edited on 16 April 2019, at 14:21 (UTC).